Open Source, Linux & More stuff that is good for you! Last week I did a house full of Kubuntu installs as recounted here. I went back to check up on the tweens and see if they needed anything. Everything seemed to be going fine, although they needed a little help connecting to a USB drive shared over the network from a Vista machine. Simple enough add network folder. Guess what, they needed write support and that is unsupported in network folders and Dolphin. Alrighty then. Add bookmark to smb://hostname/foldername. Asks for Username and password and all is good. While setting this up for them I notice a little game one of the girls is playing. 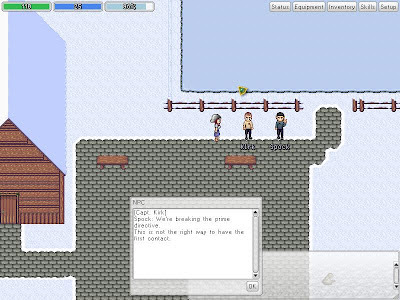 A cute little anime style mmorpg The Mana World. Hmm, I bet my daughter would enjoy that. I finish up my work and spend the rest of the night playing with compiz on another machine. Wow, after you get it working (no small feat), so purty! But that is another story for another time. OK enough, lets go install it on your machine. I often make the mistake of saying things like just open a terminal and type "sudo apt-get install tmw" to her. You know to show her how easy linux is. So simple a child could do it. After 2 spelling errors she comes back with "Package Not Found". That's strange. I follow her in, type it and you know what she is right. Well maybe it is new, we haven't updated in while, so "sudo apt-get update" followed by "sudo apt-get install tmw" followed by hunh, package not found again. Oh man, we have Feisty not Gutsy. She says what does that mean? I'll spare you the details of that conversation save for her insistence that she be able to name the next couple. Now, our Internet connection is suboptimal. It is technically Broadband but not by any real definition of that word. If you go over 50meg in a half hour they throttle you way down to 30kb a second for 2 or 3 hours. Making the distribution upgrade a less than desirable choice for a tiny little rpg. Turns out though, short of compiling it ourselves that was the only way. (I didn't try the windows package under wine, which probably would have worked.) Besides, any other workaround would not stop this from happening again. She knows these girls and if they have a game that she likes, it would be a lot easier if they shared the same repositories. So we bit the bullet. Now there are walkthroughs and howtos for this type of thing. Always doing my best to be educational, I send her off in search of a couple and we settled on this one. Which is a fine article. Even links to a nice screenshot howto for Kubuntu,Of course it doesn't take into account our dreadful download speeds and therefore says nothing about going to bed in the middle but otherwise is a fairly accurate description of how it should work. Open the Adept Manager by going to KMenu -> System -> Adept Manager (Manage Packages). In Adept -> Manage Repositories enable "Recommended updates", close and reload. Press the Full Upgrade button. Press the Apply Changes button. 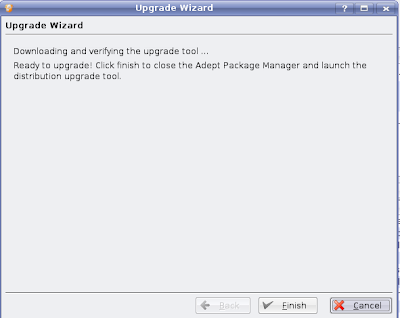 Once the packages are installed, exit the Adept Manager (Adept -> Quit). Repeat the initial steps (1-3). Steps 1 and 2 go off without a hitch. Even step 3 eventually reveals the normally hidden Version Upgrade button. When you click that button a new program is downloaded to a temp directory very quickly gotta watch for it if you wanna know where. Afterwards you are presented with this screen. Self explanatory right. Click Finish and Adept will close and your newly downloaded Upgrade tool will start. Okeydokey. Click Finish. Window closes Adept stays open and nothing else happens no matter how long we wait. Well maybe I missed something, I was only monitoring her following the directions after all, lemme in there. I follow the instructions again. I get to the same point and same result. I hear a cute little "HaHa" from over my shoulder. At this point I have once again shown her how easy this all is. But nevermind I sally forth. Tell you what, lets open Adept from a terminal instead, that way we can see the output and see where it fails. Where it fails is some strange looking Python error. Hmmm, further investigation (ie running the script directly from the terminal after running through the above process a few more times to get said script's location.) reveals that it can't connect to the Xserver. You see the above instructions are assuming that you are running on the root account, using the root's X server. Normally when doing major upgrades of this magnitude this is the preferred method. The fairly simple fix was to type "xhost +" which allows any client to connect to the X server. But she would have NEVER found that. Never.Probably running adept through the run command with kdesu would work as well, but the above instructions were specific. Notice that the newest upgrade instructions for going from Gutsy to Hardy (in Beta currently) are given this way. After that the upgrade went rather smoothly. Sort of. At some point there were dpkg errors. Similar to the ones described in the initial Kubuntu upgrade article, with the same fixes run "dpkg -a" and try again. And it happened again. and again. When all was said and done, we ran adept and were pleased to see the Gutsy indication in the update package listings. clicked tmw and she was happily playing. And it only took 2 days. As an aside, her copy is a version behind my straight debian copy, meaning her character can't have the same haircut. But that is just plain nitpicking, and I said too bad, go play. Now I tell this story not to bash Ubuntu, Kubuntu, blahbuntu or any other Linux. Just as a general observation. As far as we've come, we still have a ways to go. Lucky for her, she has me around to figure out these minor inconveniences. Since the instructions are not in a wiki, it is now recorded here, for anyone stuck. "I finish up my work and spend the rest of the night playing with compiz on another machine. Wow, after you get working, purty! But that is another story for another time." Hi. Just wanted to say cool blog and nice article in the paper this weekend! 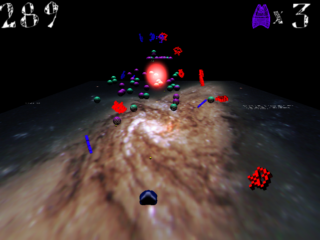 Invaders are rolling their way towards Earth & You are the planet's only hope at stemming the tide.